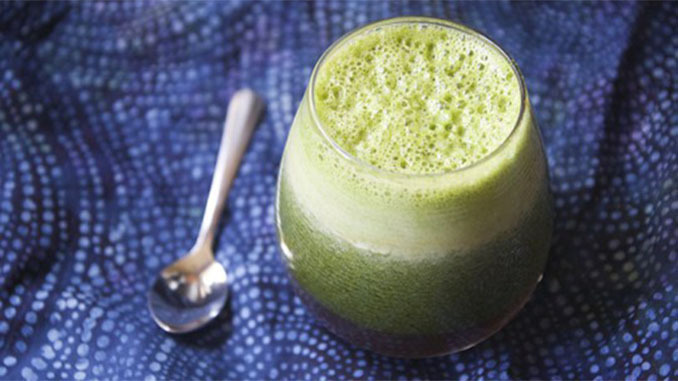 This healthy green juice only consists of a few ingredients and is ideal for anyone who’s already been on a detox regimen. It’s packed with healthy antioxidants and will give you a burst of blueberry flavor once you take the very first sip! Blueberries themselves are packed with Vitamin K and are known to help improve memory. Not only that, the blueberry’s fiber, potassium, folate, vitamin C, vitamin B6 and phytonutrient content, coupled with its lack of cholesterol all support heart health and can also help prevent heart disease. Spinach is another ingredient within our blueberry green detox juice recipe and that comes with high amounts of vitamin K and A. It’s also packed with iron, magnesium and anti-inflammatory properties which can help anyone who may have heartburn. Take a few minutes to prepare this delicious detox juice at home and see just how good it really tastes for yourself! Total prep time for this recipe is around ten minutes or so, and it will make one serving. You may also want to run your juicer at full speed before quickly shoving the spinach and blueberries through, followed by the apples. Doing this can help push more of the spinach and blueberry juices through. I hope this will good.